Alternately: The pinnacle of cunning. A sly old fox. Someone who, though long experience, has developed an almost-unbeatable level of cleverness. Notes: First, keep in mind that this is about general wits and worldly wisdom, not skill in a specific art or craft. Remember the notes to 蛇の道は蛇? Well, here we are again. A snake that lives for a thousand years in the mountains and a thousand years in the sea will grow large, and learn many things, and become a dragon. A hebi that has reached ja status is so far above its former snake fellows that there isn’t even grounds for comparison. Finally, note that some versions use 河 (kawa, “river”) instead of 山, which makes sense if you keep in mind that dragons are associated with water and that rivers seen from a mountain-top might look like long snakes or dragons, slithering across the landscape below. 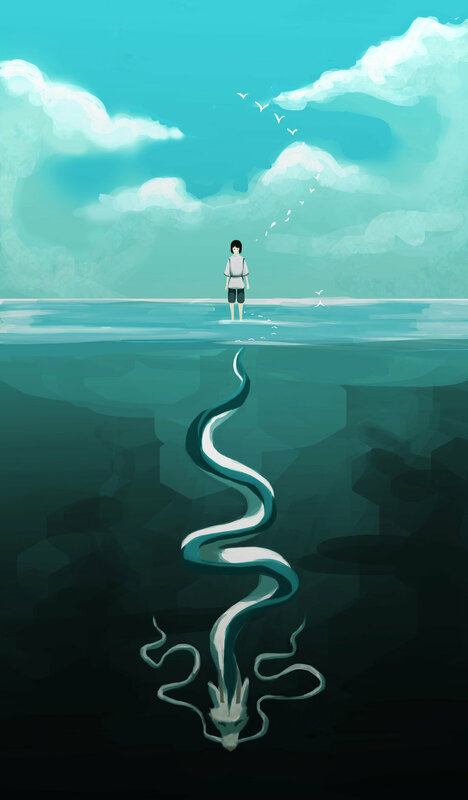 This amazing piece of 千と千尋の神隠し (Spirited Away) fanart by ensoulifly, who has graciously allowed me to use it here. Check out their other works! This entry was posted in Japanese, Yojijukugo and tagged clever, cunning, dragon, experience, snake, 山千, 海千. Bookmark the permalink.